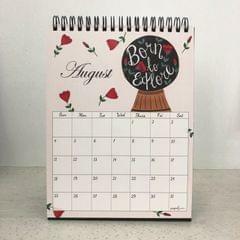 Our 2019 Desk Calendar will sit pretty on your desk & help you keep a track of your days & dates, while inspiring you with our colourful, hand-painted illustrations. Our writable, grid format will help you record & mark important dates & events. - Size: 8.5" by 6"